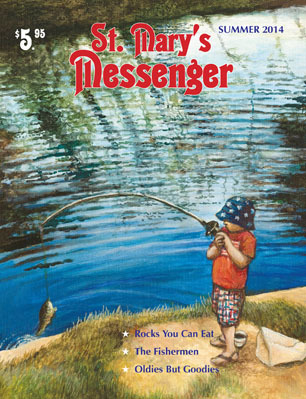 Kids can smell a phony, pious publication a mile away, but the tone of St. Mary’s Messenger is direct and unpretentious with a vibrant spirituality that connects with real kids. 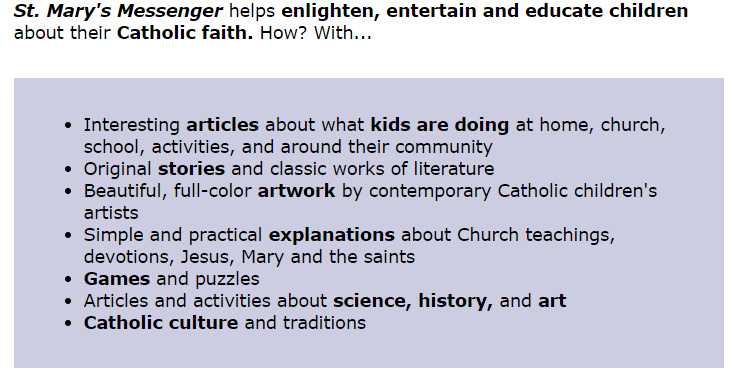 If you ever dreamed of a Catholic magazine which would capture your children’s interest immediately yet hold it as they delved deeper, look no further than St. Mary’s Messenger. Kris Weipert, the senior editor of a new Catholic children’s magazine, St. Mary’s Messenger contacted me because the blog community has been their support system. They even donated a year subscription as a giveaway if I reviewed their magazine. Maybe you will be the lucky winner of a free subscription. It was a joy, not a chore to look through it. I will review this magazine more in-depth in a few months once I have a hard copy in my hands but I could not wait to introduce this magazine because it would make an ideal Christmas gift for your kids, grandkids or kids you know. “A few years ago, we said a novena to St. Thérèse of Lisieux, and the answer was the idea for St. Mary’s Messenger, a Catholic version of Highlights, for ages 7–12. We developed a sample issue, and gave it to parents, teachers, children, priests, editors, writers, and others, to determine whether there was the need and interest for this new magazine. The answer? An overwhelming yes. 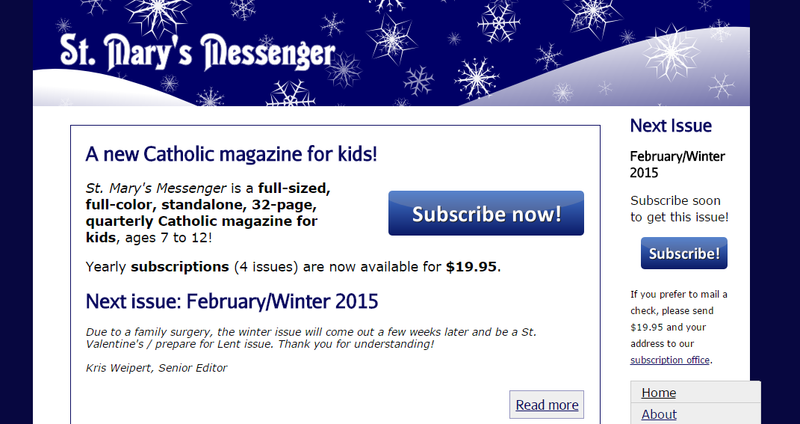 Today, you can subscribe to St. Mary’s Messenger as a full-size, 32-page color magazine, published 4 times a year. This really is a nice magazine! And the funny thing is that I’m published in the magazine you have pictured here! 🙂 I wrote the article “St. Peter’s Fishing Game”. The editors are a great group of people! Thanks for sharing this! God Bless. Yes, this does look like a great mag! I like the part where they say, “Kids can smell a phony, pious magazine a mile away.” Ha, ha, that tickled me. It’s so true! Unfortunately, my grandbabies are all either under five or over 17 right now. So, nobody fits the demographics yet. I’ll be back, though. 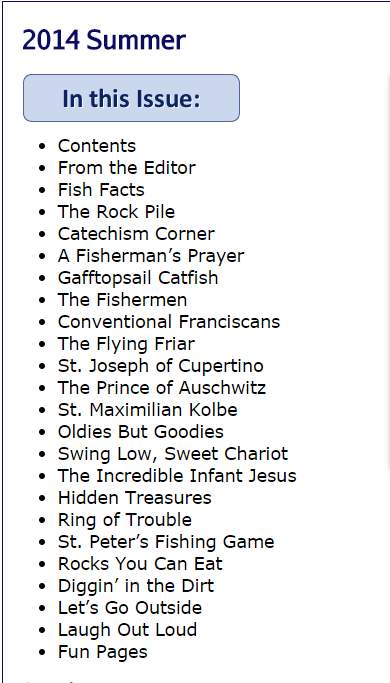 Do you happen to know a Catholic magazine for a 4 year old?